Adrian Robson was part of the first editorial team that worked on Ceefax from 1974. The first Ceefax subtitles were broadcast around 1975. The first programme to be subtitled was a film called "This is Ceefax" which described the development of the project and was narrated by a relatively unknown newsreader called Angela Rippon. 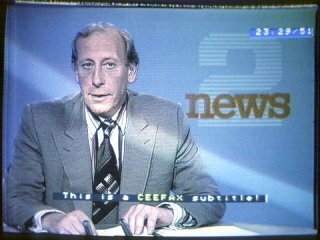 I broadcast the subtitles on my own - everyone else had gone home for the day - and it was watched on what we believed to be the country's only teletext set in a private home at that time - in the house of the Ceefax editor, Colin McIntyre! The subtitling was fairly unwieldy to operate. The software writers realised that a subtitling facility was needed and had created a "subtitling mode". When you started this process, you could type a few words and then press ENTER and this would transmit the words you had typed. What they didn't realise was that hardly anyone would be able to type fast enough to keep up with speech. So using the process in the way they had envisaged was completely impractical. So instead, I produced the subtitles in advance and stored them on yellow punched paper tape. I then used a tape reader to load the text of each subtitle onto the screen and pressed the ENTER key when it was time for that subtitle. The next subtitling exercise was probably around 1976 and was slightly more ambitious. This time we collaborated with the BBC music department which was broadcasting Carmina Burana. The subtitles were a translation into English of the words being sung. Again we prepared the subtitles on paper tape and transmitted them in sequence as the music progressed. However, it was obvious that this method of subtitling was completely impractical as a permanent method of working. I had visited Boston's WGBH television station in 1975 where they had a unit working on what they called "closed captioning". Basically, this was the same kind of technology as Ceefax but devoted to producing captions for the deaf. The unit I visited subtitled the evening news each day and people who had the necessary decoder attached to their television were able to read the captions. But I discovered that it took a whole day to prepare subtitles for one news bulletin and that was with a team of several people. I realised that we needed another way of dealing with subtitles as we didn't have the resources that they were using in Boston and our current paper tape methods also needed updating. In the meantime, I believe we had had a visit from Jack Ashley MP, who was deaf. I was intrigued to learn how it was that he could follow the proceedings of parliament without being able to hear what people were saying. What he had done was to learn how to read the output from the stenograph machines. These produced a phonetic representation of the words spoken by MPs and although I wasn't familiar with the details of how this worked, I knew Pitman's shorthand and understood the concept of representing words purely phonetically. I had thought about the possibility of simply using a stenographer to transmit the phonetic symbols to the television screen. But this really didn't seem worth pursuing as few people would have been as motivated as Jack Ashley to learn a new way of representing words. Then one day, Colin McIntyre came over to me and said he had been approached by the computer science department of a university who wondered if we could suggest a postgraduate project for one of their students. I'd already been thinking about ways of turning stenography into conventionally written words and wrote a note to Colin proposing that the university could write a computer programme that would translate phonetic symbols into conventional spelling. I was very pleased when the idea was taken up and eventually produced a system that could subtitle live programmes. One of the interesting things about working for Ceefax at that time was that we needed to develop new terminology to describe concepts that had not existed before. For example, the word teletext itself did not appear before around 1976, I think. It was invented by a computer magazine journalist (Barry Fox?) and I remember him being very pleased about having solved the problem of finding a generic name for the system. Before that we simply talked about Ceefax, Oracle and Prestel. In the area of the service itself, initially, it was not at all certain that we would talk about pages; I think there was a certain amount of experimentation with other words, like screens. I'm not certain whether there was any other computer output at that time that showed fixed pages, as opposed to scrolling displays. As in DOS, most computer displays were sequential and scrolled down forever, rather than having a fixed size. So there was no word in common use for a fixed display. We eventually stuck to pages. Another problem was how to represent the concept that a page could be one of several sub-pages. In the first 30-page system, sub-pages were limited to a maximum of four per page number. These were represented by putting A B C D along the top right hand corner of the page and making one of the letters flash (by putting an invisible control character before it) to show which of the four was on display. But when the number of possible sub-pages was increased, I think to 10 this presented a problem of how to indicate which page was being displayed. We couldn't put A B C D E F G H I J across the top of the page and the concept of representing which page of several you were looking at didn't exist in printed text. The only thing I could think of was to put, for example, 2/10 or 4/5 to indicate that you were looking at the second of 10 pages, or the fourth of five pages. But we weren't very happy with the concept. We weren't confident that people would understand what it meant. We were sure they wouldn't understand the first time they saw it but hoped that as the numbers advanced - 2/10, then 3/10 - they would realise what it meant. Colin McIntyre wasn't sure it was a good idea. He'd invented the A B C D concept and we all felt comfortable with its clarity. I remember catching him at the 7th floor lifts at Television Centre and trying to persuade him that we had to try something new now that we had more sub-pages. He said he thought we should start the new concept on a couple of pages. I said I thought that would just be more confusing and that we should do it on all pages or not at all. "Okay," he said, as he got into the lift, "We'll try it on all pages." And the lift doors closed. The concept stuck and as far as I know, this was the first use of the very common convention you now see in printed material and, of course, on computer screens. We certainly weren't aware of it before that and had doubts about whether people would understand it without explanation. I believe that Ceefax wasn't the first data signal to use the field blanking interval (your site refers to the "hitherto unused part of the television signal"). In fact, I think the idea had developed from the fact that transmitter startup and shutdown information had been transmitted in the spare lines before Ceefax was invented, and I suppose someone had had the idea that this could be expanded to whole pages of text. Why were the pages so limited in size? One factor was almost certainly the cost of memory. In around 1975 it cost �50 for the amount of memory that held one page, i.e. 40 characters on 24 lines, or around 960 bytes.